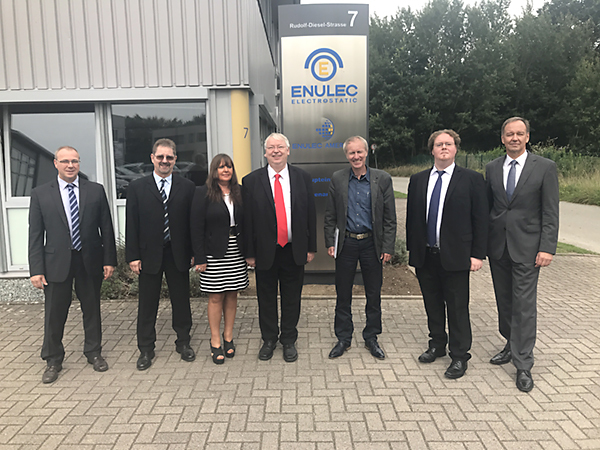 James Siever, ERA Secretary General visited the company ENULEC GmbH in Trittau / Germany and presented the official membership certificate of the ERA. Everybody knows the success story of Microsoft, starting as a garage start up and developing into a world company, which fundamentally changed the world of communication. Not that spectacular is the story of Enulec, but the company also started in a garage and eventually became a worldwide leading supplier of electrostatic assist equipment, which improves ink transfer from the gravure cells anto the substrate, and thereby avoids missing dots. Hubertus Dettke, who studied electronic engineering and made an internship with the Swiss ESA supplier Spengler, founded Enulec (Energieübertragungselektronic – energy transfer electronics) still as a student together with his wife Christa, and they actually began with their activities in the garage of their private house. Now, thirty-six years after its founding, Enulec’s modern premises and headquarters are located in Trittau, not far away from the north German harbour city of Hamburg. Over thirty highly qualified engineers and technicians are employed here to develop and manufacture ESA equipment for the packaging, decorative and publication printing industries. There are subsidiaries in Lugano, Switzerland and in St. Louis, USA, as weil as service centres and trade partners around the globe to support their worldwide customers. Altogether more than 7500 ESA installations from Enulec are now in operation all over the world. Major market for Enulec is the gravure industry which counts for 85 % of their sales. And they contributed to gravure history, as among their first clients were important names of the great times of gravure, such as Broschek Tiefdruck in Hamburg when they had problems with the web tacking of their folder, and also Springer in Ahrensburg who became their first ESA customer. Meanwhile, they focus more on packaging and decorative gravure, and a huge share of modern packaging and decorative gravure presses are equipped with their electrostatic assist systems. Since packaging gravure is strongly growing particularly in emerging markets such as China and South East Asia, this is a promise for Enulec’s future. printed five pound note would not have such a perfect ha irstyle. Taday, ESA equipment is integrated into modern gravure presses, and Enulec is working to further develop technically improved ESA integration. And they also support the education of printing engineers and technicians by sponsoring the ESA equipment af the gravure presses at Stuttgart Media University in Germany and Western Michigan University in the USA. This shows how Enulec is committed to the healthy continuity of gravure.